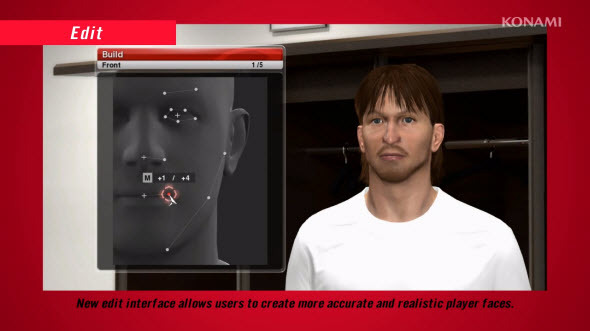 Just an hour ago Konami announced really great PES 2014 feature - Edit Mode - that allows you to customize the appearance and the clothes of game's footballers. Also the developers presented new PES 2014 trailer, in which this mode was detailed. Now you don't need The Sims 3, because in PES 2014 you can literally create your characters. Today the developers have shown a new game's mode that allows editing the faces of the footballers and customizing their clothes. To make the characters realistic and emotional, you can change their appearance in special editor. For example, on the screenshot below the developers are making the footballer smiling, moving his lips. And at the end we would like to remind you that PES 2014 will be released later this week. Stay tuned to get the fresh news about this football simulator.